I am a big fan of the cilantro. And mint ain't half bad either. So the idea of a pesto that uses both of those, a nice Parmesan cheese and some pine nuts? Yeah, I like that idea. A lot! This is an easy, versatile sauce.It is great on ravioli (get the pre-made ones from the store for a very quick dinner) and a nice condiment for kebabs (lamb, beef or chicken - I have not tried it with shrimp, that could be good, too). 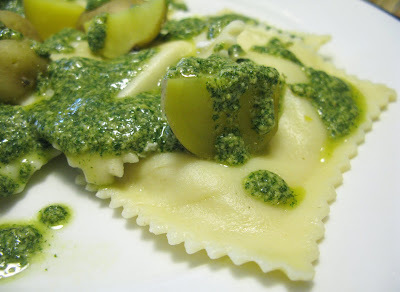 I like a traditional pesto, made with basil, just fine. But the brightness of the mint and the cilantro just make this shine as a "summer" pesto. Though I will be making this all through the fall and winter. 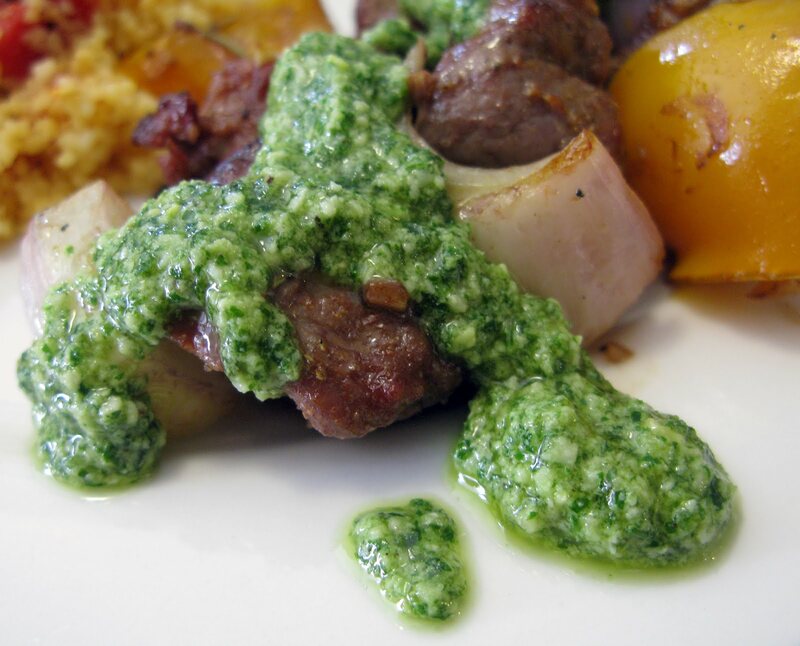 Grilled lamb and veggie kebabs with mint-cilantro pesto. Blend mint, cilantro, pine nuts, cheese, garlic, lemon juice and salt and pepper to a coarse puree in a food processor. Keeping the food processor running, slowly pour in olive oil and puree until almost smooth. Taste and add lemon, salt and pepper to taste, if needed. Enjoy on your favorite pasta for a really quick dinner (seriously, there are some really good pre-made raviolis and tortellini out there!) as a dip for a good crusty bread, as a dipping sauce for grilled meat or veggies. By the way, if you are looking for more ways to zip up that store-bought ravioli, check out these ideas from Real Simple.